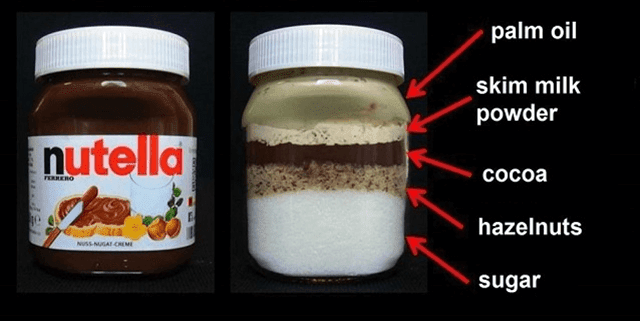 A new image has revealed that palm oil is one of the major ingredients in jars of Nutella, amongst excessive amounts of sugar. The image displaying the true ingredients of the well-known, and globally adored, chocolate spread quickly went viral after its contents were revealed that many people did not expect. Different from the usual list of ingredients on the back of the jar that is commonly overlooked, this diagram shows layers of the brand's five main ingredients in their raw form. These are palm oil, cocoa, hazelnuts, skimmed milk powder and sugar. According to reports, the size of the labelled section in the diagram is said to represent the real proportion in the jar, which many were shocked to see was 50% white sugar. This image was released earlier this week following reports that Nutella may be taken out of supermarkets due to its “cancer-causing properties”. This came after a report, conducted by the European Food Safety Authority (EFSA), claimed that palm oil was more carcinogenic than any other oil. However, since the reports, Nutella has denied the claims that the hazelnut chocolate spread carries cancer risks, stating that the palm oil that they use in every jar is high quality and safe to eat. Whilst Nutella would not confirm or deny if the image is accurate, due to claims that the recipe is top secret, the nutritional information on each jar, as well as the website, reveals that there is 8.5g of sugar in every tablespoon of the spread, which means that every 400g jar contains a huge quantity of 227.2g of sugar. This vast amount works out to be more than half the jar's weight. Another major ingredient that has caught many people's attention is the use of palm oil. Whilst palm oil is the cheapest oil on the market, the use of it is highly controversial, as it has major links with deforestation of major rainforests, as well as wiping out huge wildlife populations. Although palm oil is used in a huge array of common products, from cosmetics to food, the excessive consumption of the oil has had a major negative effect on the natural world. Palm oil plantations currently cover over 27 million hectares of the Earth's surface. This has resulted in a huge loss of forests and human settlements, as these areas are completely destroyed to make room for the oil plantations, which have since been referred to as “green deserts”. Despite this, Nutella relies on the use of palm oil to create the distinctive smooth texture, as well as prolonging the product's shelf life. Nutella, which is made by Ferrero, insists that the product would not be the same without the use of palm oil, and a switch to alternative ingredients could cost the company an additional $8-22 million a year.